Formula 1 never looked so good in the sparkling TAG Heuer WAC1214-BAO852 women’s timepiece, made of stainless steel. The watch is stunning with 120 .75 carat bezel set diamonds, which are certified 1 for clarity. The TAG Heuer Formula 1 Diamonds ladies watch is driven by Swiss quartz movement designed to provide accurate timing. Inside the black face of the timepiece are silver hour markers, complimented by matching minute markers on the outside of the rim. The front is tightly sealed with scratch resistant sapphire crystal, water resistant up to 200 meters or 660 feet. The Formula 1 watch is made for durability, fashion and longevity and contains a convenient double lock deployment clasp. The hands and marker light up in the dark to creative a wonderful contrast against the black background. 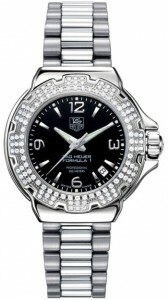 TAG Heuer also provides an alternate mother of pearl for the face to create a more elegant look. A special fact about the TAG Heuer Formula 1 watch is that tennis champion Maria Sharapova, who is a brand ambassador for company, has promoted it. 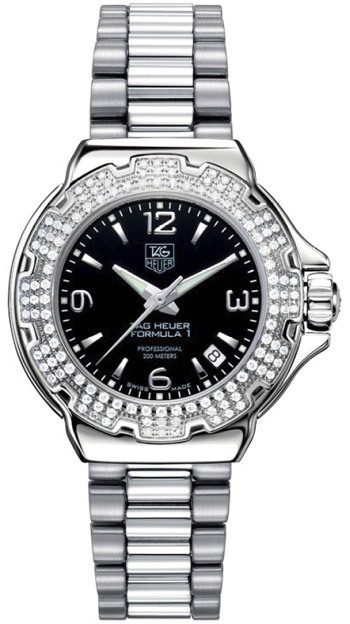 As with most TAG Heuer timepieces this women’s watch can also be interchanged with different wristbands. The average retail for this amazing timepiece is $2,300.00.